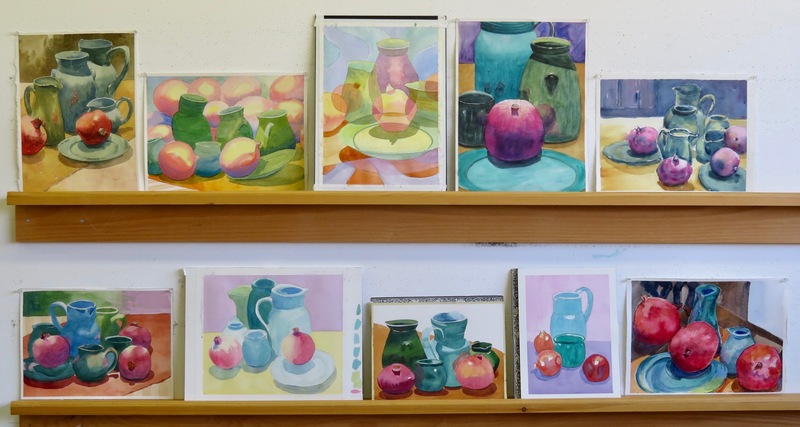 Fall Watercolour Classes at Arts on Adrian – Week Three! It’s pomegranate season! I’d been keeping an eye on quality and prices for the past week or so and the creativity stars aligned in time for our Saturday and Tuesday classes. 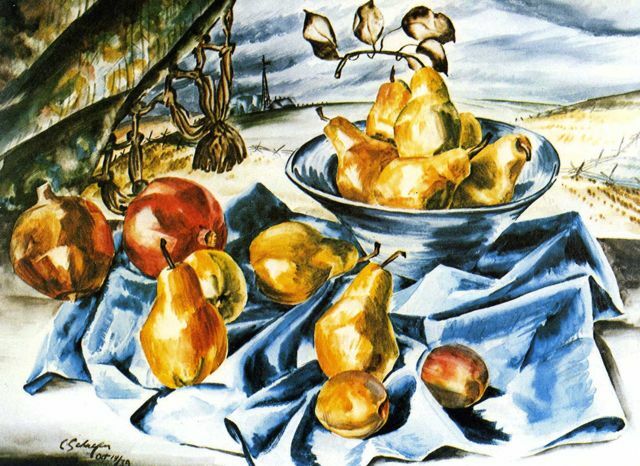 Cézanne loved to paint pomegranates and that’s good enough for me. I talked mostly about colour selection on Saturday. The study on the upper right shows cast shadows on three different surfaces; a green plate, a gold fabric and a white fabric. Notice how the colour of the cast shadow relates to the colour of each surface. I discussed the lessons from the Saturday demonstration with the Tuesday students, as well. In addition to that, I did a few studies and varied the washes using soft edge techniques. The students paid attention to my offerings but didn’t need me for inspiration. Maybe, they channeled their inner Cézannes. 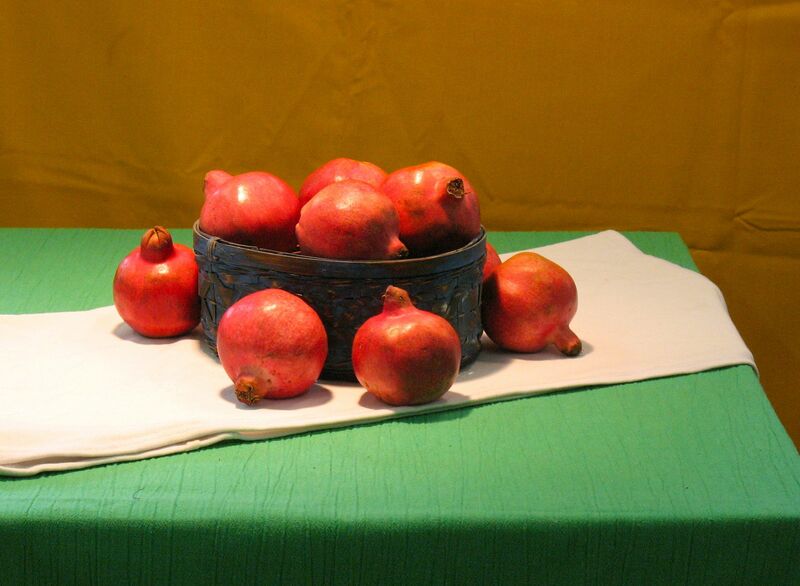 They certainly made the most of our annual still-life of juicy pomegranates. 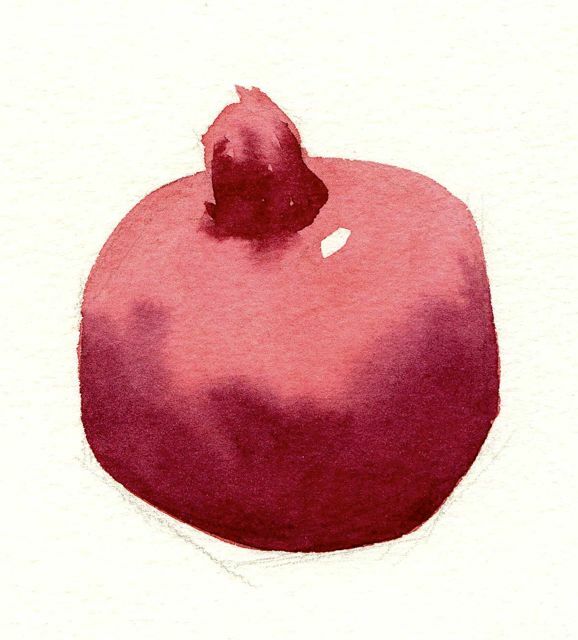 I always enjoy painting pomegranates. Also, it gives me a chance to talk about reds and some brush-handling techniques. 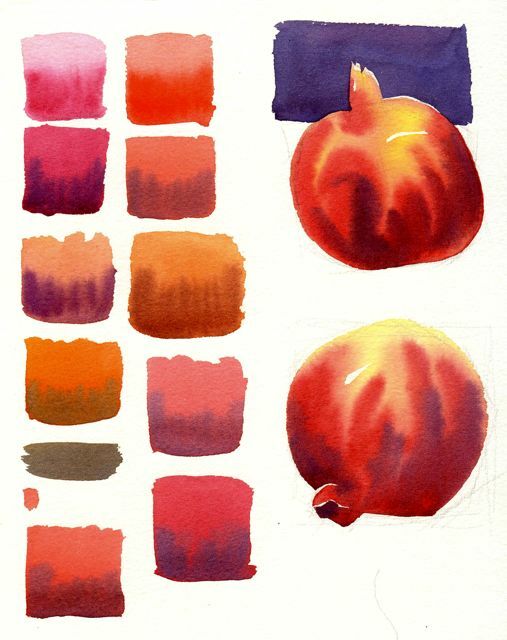 An artist can never do enough colour testing and, with watercolour, it’s important to practise your timing with soft-edge techniques. The reds in my palette are Rose Madder Quinacridone and Permanent Red from Da Vinci. I tried them in different combinations, adding Cobalt Blue and Aureolin to create varying values and hues. Sometimes, we paint the first wash of an object and it dries before we can touch in another colour or value. In the example below, I waited for the first wash to dry thoroughly. Then, I painted the shadow on the stem area with a darker wash and touched it’s edge in places with a damp brush. 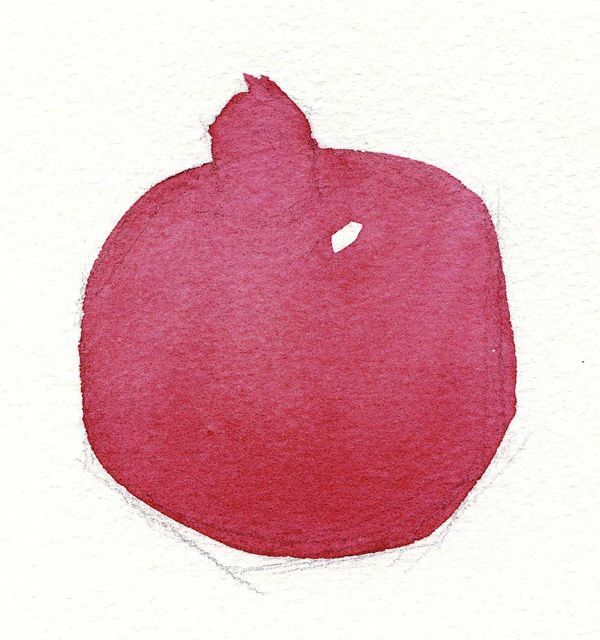 Next, I painted a band of clean water across the upper middle area of the pomegranate. I started the dark wash on the lower edge of the water and continued it to the bottom of the object. The simplification of form creates a three-dimensional quality. 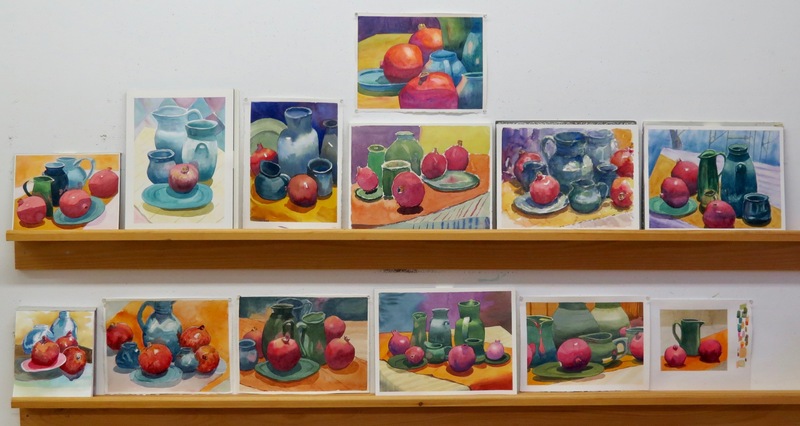 Partway through each class, I called the group over to show them some watercolours by a ‘guest artist’. Yesterday’s guest was Canadian artist Carl Schaefer (1903-95). Schaefer used a lot of soft-edge in his work but not exclusively. Often, he would build forms with repeated brushstrokes, giving objects an angular, chiseled look. Here’s the student work from Tuesday. As you can see, they really applied themselves.